A lining is an extra layer of fabric added to the Curtains or Roman blinds. All of Ada & Ina's lining fabrics are White or Ivory, in order to preserve the colour of the original curtain fabric. A thin cotton fabric. A layer of cotton lining will make your curtains or blinds stronger and more stable. It also blocks out some daylight. A blackout lining is a somewhat thicker fabric (260g/m2) than the cotton lining, and when used for curtains, blocks out daylight completely from coming through. Curtains with blackout lining are especially recommended for bedrooms and living rooms, where blocking daylight is important. Thermal lining is a slightly thicker fabric (210g/m2) than cotton lining. This lining is used for thermal insulated curtains, which prevents heat from escaping during the winters, as well as protects your home from the heat during the summer. Insulated curtains often help with energy costs. Bonded Blackout lining is much thicker lining (400g/m2) than normal Blackout, Cotton or Thermal lining. This lining offers all the benefits of a Blackout lining and is excellent for thermal insulated curtains, that prevent heat from escaping during the winters, as well as protects your home from the heat during the summer. Insulated curtains often help with energy costs. Bonded Blackout lining also has noise reducing properties and will help in soundproofing your window, which suits windows facing noisy streets or apartments in cities. Bonded Cotton lining is a thicker lining (270g/m2) than normal Blackout, Cotton or Thermal lining. 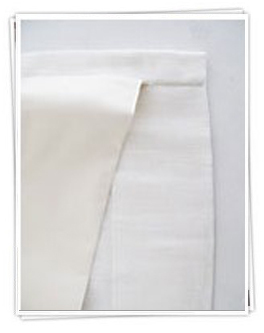 This lining offers all the benefits of a Cotton lining and is excellent for thermal insulated curtains. Ideal for Curtains and Roman blinds to improve drape and appearance. Bonded Cotton lining lining also has noise reducing properties and will help in soundproofing your window, which suits windows facing noisy streets or apartments in cities.